This international collection discusses how the individualised, reflexive, late modern era has changed the way we experience and act on our emotions. Please contact Michelle to request a FREE copy of any of the journal articles or book chapters listed below. PATULNY, Roger, Alberto BELLOCHI, Rebecca OLSON, Sukhmani KHORANA, Jordan McKENZIE and Michelle PETERIE (Eds.) (2019) Emotions in Late Modernity. Abingdon and New York: Routledge. McKENZIE, Jordan, Rebecca OLSON, Roger PATULNY and Michelle PETERIE (Eds.) (Forthcoming 2019) ‘Special Issue: Shame, Anger and Community’. Emotions: History, Culture, Society. Volume 3, Issue 2. Copies available upon request. Please contact Michelle. PETERIE, Michelle, Gaby RAMIA, Greg MARSTON and Roger PATULNY (Accepted, In Press) ‘Social Isolation as Stigma-Management: Explaining Long-Term Unemployed People’s “Failure” to Network’. Sociology. PETERIE, Michelle, Gaby RAMIA, Greg MARSTON and Roger PATULNY (Accepted, In Press) ‘Emotional Compliance and Emotion as Resistance: Shame and Anger among the Long-Term Unemployed’. Work, Employment and Society. MARSTON, Greg, Juan ZHANG, Michelle PETERIE, Emma COOKE, Gaby RAMIA and Roger PATULNY (Accepted, In Press) ‘To Move or Not to Move: Mobility Decision-Making in the Context of Welfare Conditionality and Paid Employment’. Mobilities. PETERIE, Michelle (2019) 'Compassion and Power: (Emotional) Reflexivity in Asylum Seeker Friendship Programmes'. In Patulny, Bellocchi, Olson, Khorana, McKenzie and Peterie (Eds.) Emotions in Late Modernity. Abingdon and New York: Routledge. PATULNY, Roger, Rebecca OLSON, Sukhmani KHORANA, Jordan McKENZIE, Alberto BELLOCCHI and Michelle PETERIE (2019) ‘Introduction’. In Patulny, Bellocchi, Olson, Khorana, McKenzie and Peterie (Eds.) Emotions in Late Modernity. Abingdon and New York: Routledge. 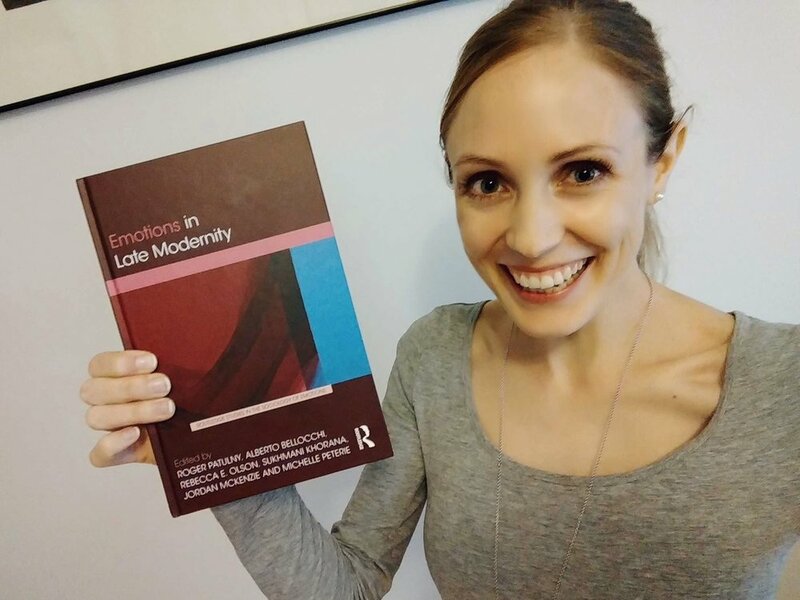 PATULNY, Roger, Rebecca OLSON, Sukhmani KHORANA, Jordan McKENZIE, Alberto BELLOCCHI and Michelle PETERIE (2019) ‘Conclusion: Emotions in Late Modernity’. In Patulny, Bellocchi, Olson, Khorana, McKenzie and Peterie (Eds.) Emotions in Late Modernity. Abingdon and New York: Routledge. PETERIE, Michelle (2018) ‘The Trauma Machine: Volunteer Experiences in Australian Immigration Detention Facilities’. Unpublished PhD Thesis. University of Sydney. PETERIE, Michelle. 'Forced Mobility: The Movement of Asylum Seekers around Australia's Immigration Detention Network'. The Australian Sociological Association Conference 2018. Deakin University, Melbourne. 19-22 November 2018. PETERIE, Michelle, Roger PATULNY, Gaby RAMIA and Greg MARSTON. 'Unemployment, Social Networks and Wellbeing'. The Australian Sociological Association Conference 2018. Deakin University, Melbourne. 19-22 November 2018. PATULNY, Roger, Michelle PETERIE, Gaby RAMIA and Greg MARSTON. ‘Managing Shame and Depression in Unemployment’. Combined European Sociological Association and British Sociological Association Sociology of Emotions Conference. Edinburgh. 28-30 August 2018. PATULNY, Roger, Michelle PETERIE, Gaby RAMIA and Greg MARSTON. ‘Surface Acting or Stigma Management? The Emotion Management Practices of Employed and Unemployed People’. Work, Employment and Society Conference. Belfast. 12-14 September 2018. RAMIA, Gaby, Michelle PETERIE and Roger PATULNY. 'Harnessing Informal Networks'. ConnectUp: CoAct Annual National Conference. Doltone House, Sydney. 22-23 May 2018. RAMIA, Gaby, Michelle PETERIE and Roger PATULNY. 'Social Networks, Governance Networks, and Unemployment'. Government and International Relations Colloquium Series 2018. The University of Sydney, Camperdown Campus. 12 April 2018. PETERIE, Michelle. 'Compassion as Activism: Reaching Across Boundaries'. The Australian Sociological Association Conference 2017. The University of Western Australia, Perth Campus. 27–30 November 2017. RAMIA, Gaby, Greg MARSTON, Michelle PETERIE and Roger PATULNY. ‘Boundary Spanning or Boundary Making? The Networks of NGO Leaders in Employment Services’. Australian Social Policy Association: Policy Studies Group Workshop, Melbourne. 2017. RAMIA, Gaby, Michelle PETERIE, Greg MARSTON, Roger PATULNY and Claire SEAMAN. 'Beyond "Who You Know": A Qualitative Analysis of Social Networks and Job Search in Australia'. Australian Social Policy Conference. The University of New South Wales, Kensington Campus. 25-27 September 2017. PATULNY, Roger, Claire SEAMAN, Greg MARSTON, Gaby RAMIA and Michelle PETERIE. 'The Role of Personal Networks in Helping Australians Find Jobs'. Australian Social Policy Conference. The University of New South Wales, Kensington Campus. 25-27 September 2017. PETERIE, Michelle, Gaby RAMIA, Greg MARSTON, Roger PATULNY and Claire SEAMAN. 'It's Not Just the Size of Your Network that Counts, It's If and How You Use It'. Australian Social Policy Conference. The University of New South Wales, Kensington Campus. 25-27 September 2017. PETERIE, Michelle. 'Secondary Prisonization in Australia’s Onshore Immigration Detention Network'. Politics and Crime Control in the 21st Century: Controversies and Challenges. The University of Newcastle, Sydney Campus. 22 September 2017. PETERIE, Michelle. '"They Were Broken": Australian Immigration Detention and the Production of Trauma'. Symposium on Transnational People-Movement and Social Rights. The University of Sydney, Camperdown Campus. 12-13 December 2016. PETERIE. Michelle. '"They Were Broken": Australian Immigration Detention and the Production of Trauma'. First International Conference on Contemporary and Historical Approaches to Emotions. The University of Wollongong, Sydney CBD Campus. 5-7 December 2016. PETERIE, Michelle. ‘The Agonising Position of Witness: Volunteers, Trauma and Australia’s Onshore Immigration Detention Network’. The Australian Sociological Association Conference 2016. Australian Catholic University, Fitzroy Campus. 28 November-1 December 2016. PATULNY, Roger, Claire SEAMAN, Gaby RAMIA, Greg MARSTON and Michelle PETERIE. ‘Many, Weak, Instrumental, Work-ties? What Sort of Personal Networks Help Us Find Jobs?’ The Australian Sociological Association Conference 2016. Australian Catholic University, Fitzroy Campus. 28 November-1 December 2016. PETERIE, Michelle. ‘Technologies of Disempowerment: Institutionalised Trauma in Australia’s Detention Network’. The Australian Political Studies Association Conference 2016. University of NSW, Kensington Campus. 26-28 September 2016. PETERIE, Michelle. ‘The Stories We Tell Ourselves: Discourses of Compassion in Australia’s Asylum Seeker Debate’. The Australian Sociological Association Conference 2015. James Cook University, Cairns. 23-26 November 2015. PETERIE, Michelle. ‘“These Few Small Boats”: Asylum Seeker Discourses of Australia's 1977 and 2001 Liberal Governments’. Boat People: The Long History of Immigration in Australia Conference. Western Sydney University, Parramatta Campus. 12-13 June 2014. PETERIE, Michelle. ‘The “Soft” Violence of Onshore Immigration Detention’. Overland Journal. 22 October 2018. Sydney Ideas: 'Trapped In/Pushed Out: Border Politics in the US and Australia', University of Sydney, 12 April 2017. Speakers: David FITZGERALD, Graham THOM, Michelle PETERIE, Behrouz BOOCHANI, Omid TOFIGHIAN. A podcast of the event is available HERE. Michelle speaks from 49:45. Featured Member Profile, The Australian Sociological Association’s Postgraduates Website, 17 October 2017.